“How much money do people typically imagine they should have when saving for emergency needs? Is that different from what they need for the children’s education? What kinds of conversations are field staff having? In October 2017, we introduced the Financial Advisory Services (FAS) mobile app designed to allow field officers at SAJIDA Foundation to identify members (as SAJIDA calls its clients) with longer-term savings potential, structure conversations around life goals, and simulate scenarios to arrive at appropriate amounts and terms for the term-deposit savings account. Built into the FAS app is the capability to collect detailed usage data, including when and where the app was used, what actions were undertaken, and what information was entered to simulate scenarios. Any interaction on the device, such as the click of a button, filling in a text field, or submitting a form, is recorded. More than 20 officers used the FAS in 2017 and undertook 11,793 actions on the app. By threading together consecutive actions, we can approximately reconstruct actual conversations. 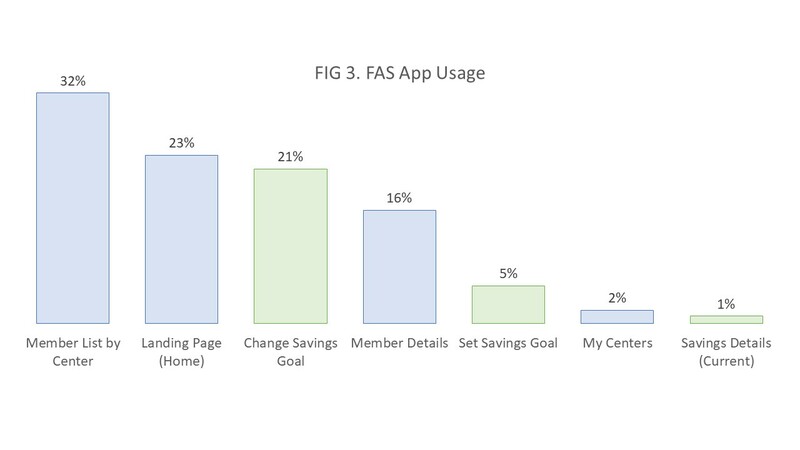 When starting a conversation, field officers mention most of the savings goals the FAS offers (Figure 1). 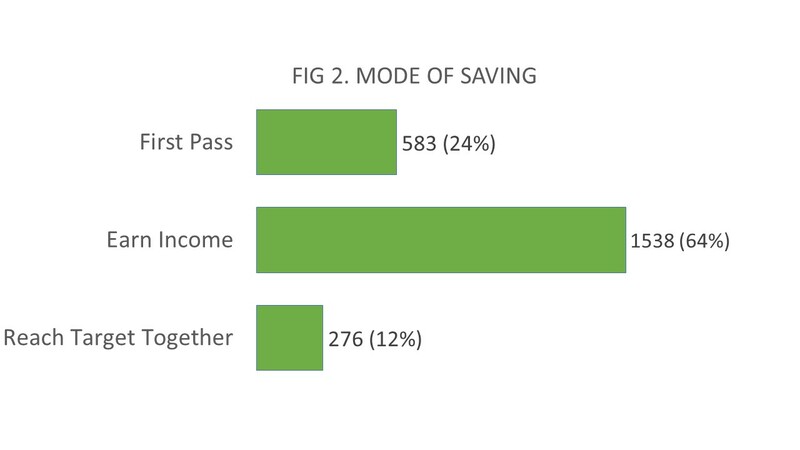 Users were able to choose from a list of eight specific goals and one “other.” These goals are chosen based on qualitative research with members and staff, and appear to be a fairly accurate representation of member savings goals. “Emergency Needs” is the most common, featuring in 31 percent of the conversations. The icon “For Children” comes second, at 25 percent. “Livestock” features in only 1 percent of the conversations, leading us to question its permanence on the goal screen. The FAS app offers two simulation tools, allowing field officers to work through two possible scenarios around how much to save now, and what amount to withdraw at the end of the term. Members can choose to put aside a lump sum that earns interest, and the app tells them how much they can expect to withdraw at the end of the term (“Earn Income” in Figure 2). Or, clients can enter a future desired withdrawal amount—a target—and the app tells them the value of the deposit needed to get to that target in the desired period of time (“Reach Target Together” in Figure 2). The “Earn Income” option is about five times more popular than the “Reach Target Together” option. Whether this is a function of actual preference for earning interest or a result of understanding one option better than the other is not clear. Note that “First Pass” captures the first time the field officer lands on the simulation page, when neither option has been chosen. We also noticed that, over time, field officers started using the initial pages of the FAS app for general monitoring of their groups. The “Member List by Center” page provides indicators for quality of loan, savings and length of membership, which is useful information for field officers looking to speak to specific individuals about their specific issues. This page constituted about one third of all the 12,000 actions. 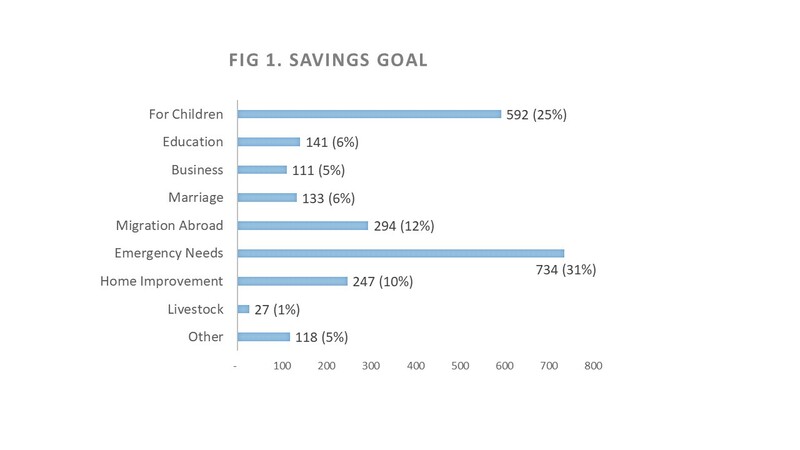 For comparison, 5 percent of the actions (~600) were around setting a savings goal, and another 21 percent (~2,500) around changing the savings goals during the conversation. The FAS app allows amount and term to be chosen for any of the nine goals. This has resulted in the members discussing a range of amounts and terms for any given goal, scenarios which they entered into the system and that we are able to extract and analyze (Figure 4). Note that if multiple amounts and terms were considered, all of them were mapped. 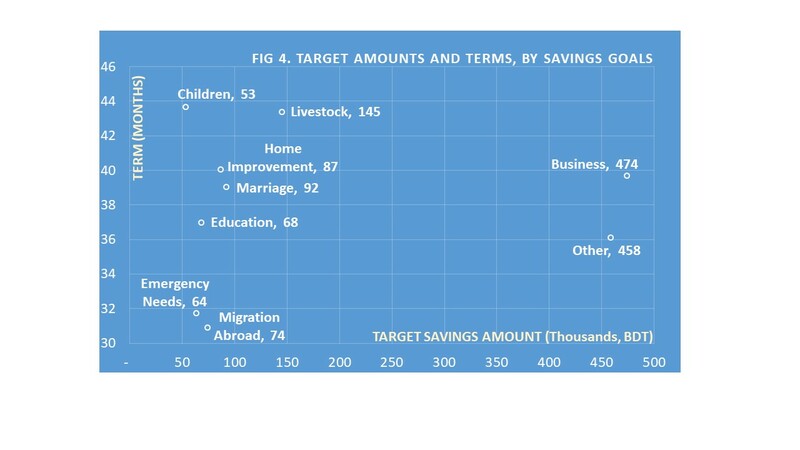 ● Saving for “Emergency Needs” and “Migration Abroad” involve the shortest time frames of around 2.5 years, while “For Children” and to “Livestock” have the longest time frames of around 3.5 years. ● Saving “For Children” involves the smallest amount, around Tk. 53,000 (US$630), while the largest amounts are associated with “Business”, at around Tk. 470,000 (US$5,600). Median amounts varied by goal. 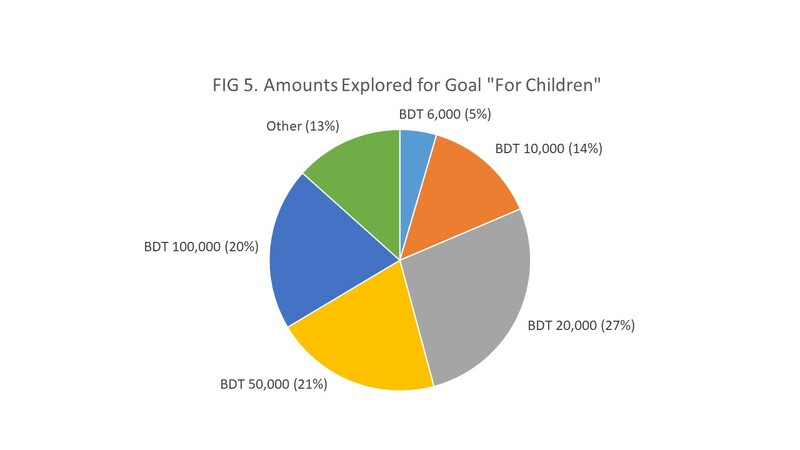 For example, for the goal “For Children,” the median amount is Tk. 30,000 and the mean is Tk. 53,000. And the range is wide: while 5 percent of conversations explored an amount of Tk. 6,000 (US$73), 20 percent explored an amount of Tk. 100,000 (US$1,220) (Figure 5). Given that a field officer’s primary responsibility is originating and servicing credit, it helps to be able to see whether the regular encouragements to attend to term-deposit savings is yielding fruit. “The 11,793 actions translated to 1,614 conversations undertaken by about 20 field officers in 2017,” a figure that suggests field officers used the app a fair bit. Usage is not uniform across all field officers, though. The top five officers were responsible for 70 percent of the transactions. This skew partly reflects turnover in the two branches where the 10 devices were provided with the FAS installed, as well as varied interest in the FAS on the part of the staff. Field officers do seem to move about in their area of operations and have these conversations in the field. The spread of those locations and diversity of times are encouraging as it shows that staff made the effort to go to members’ houses at times other than when center meetings happen, allowing for more personal conversations. Usage data has also been useful to retrain staff when needed. Usually, this has been because they were not spending enough time on conversations or there was some other shortcoming with their mode of engagement. On rare occasions, it has been to address errant behavior. In one case, one staff member spent 45 minutes on a weekend punching away at buttons on the screen to rack up action records because he thought that this type of engagement was incentivized. The FAS app allowed SAJIDA to progress significantly in cross-selling savings to their credit clients – a key goal in joining the OPTIX program. By supporting customized financial planning, the FAS is designed to contribute positively to the financial health of its members, particularly with its focus on providing the ability to financially plan for the future and to stave off financial shocks. Field officers estimate that the current rate of conversation is about 20 percent. A customer relationship management (CRM) tool would allow SAJIDA to better track conversion rates from the conversations involving the FAS app. As the pilot implementation of the FAS app concluded, SAJIDA decided to merge the app into its Microenterprise Loan Origination app, providing the loan officer with a single tool to manage the borrowing and savings relationship of the client. CEP, the OPTIX partner in Vietnam, has rolled out its own version of the FAS with customized in savings goals. As these partners continue to seek the best tool to help clients meet their financial health needs, we will keep you posted through blogs, webinars and other publications as these stories unfold.